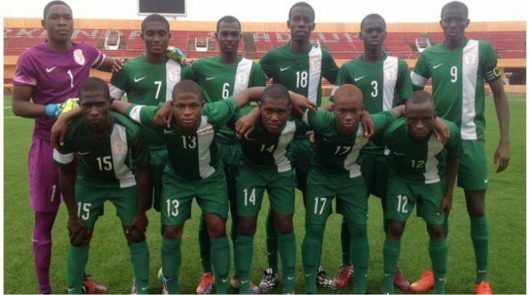 Five-time champions Nigeria will guarantee a return to the FIFA U17 World Cup finals if they overcome Angola’s U17 squad in their second match at the Africa U17 Cup of Nations in Dar es Salaam, Tanzania today. A reproachable slack approach saw the Golden Eaglets slump from a 3-1 lead to conceding three goals and falling behind against host nation Tanzania in the tournament opener on Sunday, but they woke from slumber in good time to win with two spectacular goals and pocket three precious points in a 5-4 win. Angola’s 1-0 win over Uganda hours later has ensured that the winner of the top-of-the-table duel between Nigeria and Angola today would have one leg in the semifinals and automatically in the FIFA U17 World Cup slated for Brazil later this year. All four semi-finalists at the ongoing championship in Tanzania will represent Africa in Brazil. Two-goal hero against Tanzania, Wisdom Ubani and Man-of-the-Match Akinkunmi Ayobami Amoo will be the cynosure of all eyes in the Eaglets’ attacking line on Wednesday. Yet, Ibraheem Jabaar, who slammed in the winning goal against the Serengeti Boys minutes after coming on as a substitute, is also capable of making things happen, just as Olakunle Olusegun, Fawaz Abdullahi and Olatomi Olaniyan. In todays other match of Group A, hosts Tanzania will tackle Uganda in a match of two teams still hunting for their first points at the tournament.